SideBand - for learning music by ear. iOS app for learning music by ear. Slow down, loop and change the key. 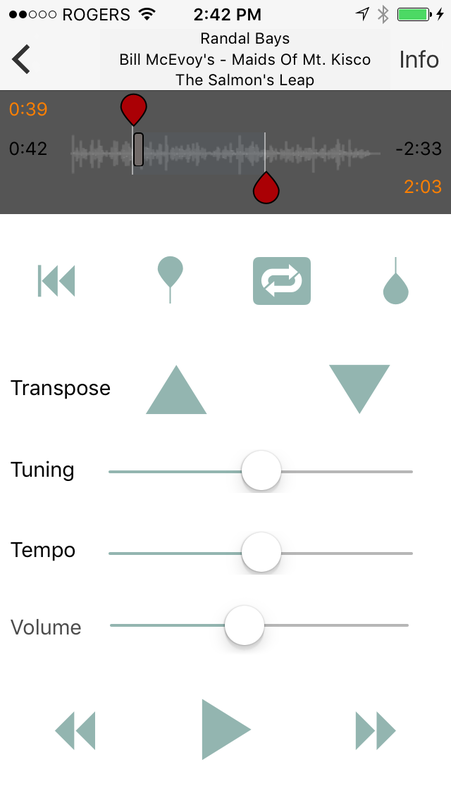 Sideband is an app for iPhone and iPad for musicians to slow down, transpose, and loop sound files for learning riffs and practicing. SideBand was built for musicians to learn by ear. Import music from your iTunes library or drag onto iTunes from your desktop. Set loop points, slow the tune down to a manageable speed. As a vocalist, find a better key to fit your voice. Sideband now supports iPads natively, so you can use the latest multitasking features have side-by-side panes or slideover. It also lets you use Sideband in landscape orientation. Display metadata and add notes. Accept files using AirDrop or from MusicMemos, DropBox or Mail - actually, any app that can export audio can send it to Sideband. Transpose playback to find the right key for your voice. Speed up to 200% or slow down to 50%. Set loop points by tapping in and out. Adjust them with sliders. Compensate for an out-of-tune recording by adjusting the fine tuning. Reset tempo or tuning with a single tap. Play audio in the background, so you can play along with a music notation app such as the Craic. On the newest iPads, use multitasking to import, control and loop Sideband alongside another app. For instance, you can import the currently playing selection into Sideband without interrupting your Music player.